NBCSports.com's Dan Feldman is grading every team's offseason based on where the team stands now relative to its position entering the offseason. A 'C' means a team is in similar standing, with notches up or down from there. The Rockets downgraded. LeBron James didn't form a super team anywhere. Only the Raptors emerged as a new contender, and that's only if Kawhi Leonard is healthy. The Warriors' path to another championship looks even clearer now than it did at the beginning of the summer. Oh, and they signed DeMarcus Cousins. Of course Golden State isn't assured a third straight title and fourth in five years. I've been banging the drum against the inevitability of a Warriors championship during this entire run, and I'm sure not stopping now. There are too many variables just to assume one team will cruise against a field of 29 others. But few teams have ever looked so well-positioned entering the season. Golden State returns its entire elite core. Kevin Durant re-signed, though on just another 1+1 deal. Uncertainty seems unavoidable with him. At least he'll be a known factor next season. The same can't be said of Cousins. Cousins' Achilles tear makes it unclear when he'll play, let alone when he'll play at a high level. Even once he gets healthy and on track individually, there are real questions about how he'll fit with the Warriors. Cousins won't necessarily be the dominant force that stacks the deck insurmountably in Golden State's favor. There was also a real opportunity cost to signing him. The Warriors needed more wings rather than another center, and they used their biggest tool to upgrade - the mid-level exception - on Cousins. And they'll almost certainly get him for only one year. The largest starting salary they can effectively offer him next summer is just $6,404,400. If Cousins can't command far more than that on the open market, he probably wouldn't be welcomed back, anyway. All that said, Golden State had to sign him when he agreed to play for so little. He's so darned talented. It's worth the risk. If everything pans out, he could help the 2018-19 Warriors stake a claim as the greatest team of all time. Otherwise, the Warriors were pretty conservative this summer. They drafted Jacob Evans No. 28 and signed Kevon Looney and Jonas Jerebko to minimum contracts. Patrick McCaw will probably accept his qualifying offer. David West retired. JaVale McGee signed with the Lakers. Zaza Pachulia signed with the Pistons. Nick Young remains unsigned. On a team with Durant, Stephen Curry, Draymond Green, Klay Thompson and Andre Iguodala, those players just don't move the needle much. Golden State was mostly locked into a static summer by virtue of the team's incredible standing already. 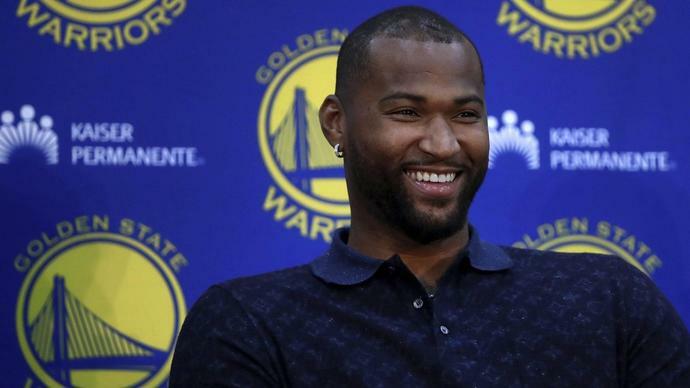 So, it was shocking the Warriors added a potential gamechanger in Cousins. But the biggest moves for Golden State were the ones that didn't happen elsewhere to threaten its supremacy. It was clearly bad the second it happened - a non-contact injury where DeMarcus Cousins went to the ground grabbing his left thigh. While the Warriors wouldn't put an official timeline on it, Cousins was done for the postseason. Speaking to the media on Wednesday, Steve Kerr confirmed that Cousins is likely done for the playoffs, but on the bright side will not need surgery.